"I believe the creative process in all its many forms is the key to emotional, physical and spiritual wellbeing". Janet Weight Reed. "Best known for her love of colour and spontaneous painting, Janet has worked and exhibited widely for the past forty years on both sides of the Atlantic. Her works can be found in many private and corporate collections worldwide". 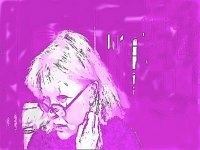 Along with painting, Janet is currently writing a book and can be found on FB - Twitter and Youtube.